I came back from New York to over 100 degree temperatures and a slightly neglected and droopy garden. So you can imagine my surprise when I found actual food out there. That's just a small representation of the amount of peppers that I've harvested. We have a bagful in the freezer. I was very happy to pluck the cucumber because I've planned veggie sandwiches for my lunch this week. 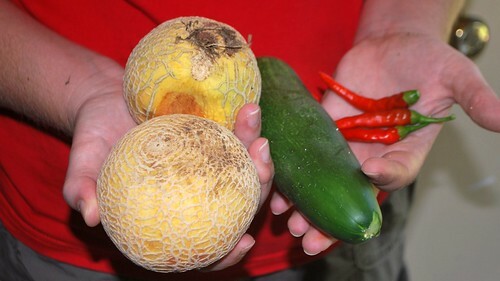 The cantaloupe were the biggest surprise. I have two more out there that were not ready for picking. These two may be small, but we ate one of them already. It was sweet and juicy and perfect.